A lot of work goes into being an estate sale professional, and appraisal and pricing is a pretty big part of the job. While learning hands-on can never be replaced with anything online, there’s no denying the Internet has been a boon to the estate sale industry. Aside from the big guns like WorthPoint, Kovel’s, and eBay, you can still find a wealth of knowledge on lesser known (and let’s face it, often less aesthetically pleasing) websites. Remember – older websites are like estate sales: it may take some digging, but there are a few gems to be found! Facebook Groups are also useful when it comes to estate sale pricing and appraisal resources. “Closed” Facebook Groups are usually vetted (sometimes exclusive to those in the industry), but public groups can also yield valuable nuggets of information. Estate sale professionals should definitely join the Estate Sale Company Network, the largest private group of estate sale professionals on Facebook. Get in touch with a community of professionals in your field for networking and support, ask industry-related questions, including those about estate sale appraisal and pricing, share stories, and get advice from experienced pros. Plus, humor! 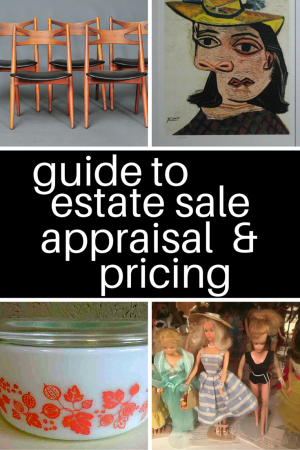 We’ve put together a list of resources to help you with appraisal and pricing for your next estate sale. We gathered websites for just about everything – from antiques to video games. If there’s a site you love to use that we forgot to include, share it in the comments below! Likewise, if you come across a site that’s defunct, tell us and we’ll have it removed. Pro-tip: Some museums offer public “appraisal days” – check with your local museum. Pro-tip: You might consider hiring an ASA or ISA certified appraiser to handle fine art or rare items. Pro-tip: If you have a lot of very expensive jewelry to deal with, you may consider letting an auction house handle the sale. Immersion learning: While (sadly!) the Pyrex Museum in Bremerton, WA, has shut down, check out this Pyrex exhibit if you’re in Corning, NY, early 2016. Book smarts: If you handle many antique or vintage radios, get a copy of the Collector’s Guide to Antique Radios: Identification and Values. What are your favorite websites to use for estate sale appraisal and pricing resources? Let us know in the comments!